What weighs 90 kg, is approximately one billion years old, and was found in the Sahara Desert? An L-6 type chondrite meteorite, of course – and this one happened to find its way to a first-year astronomy class at Laurier. Students in Ioannis Haranas’ course, Astronomy 1: Our Place in the Cosmos (AS101), had the unique opportunity to inspect the chondrite mass, which likely originated from a meteorite more than 100 km in diameter, as suggested by its mineral composition of olivine, hypersthene, iron-nickel, and trolite. The meteorite and related samples came to Haranas’ class via Patrick Hermann, a well-known meteorite collector from the Toronto area. Nick Balaskas, a lab technician in the Department of Physics and Astronomy at York University, complemented the meteorite samples with a lecture about their origins. Balaskas presented fragments from the Chelyabinsk meteor that fell in Russia in February 2013. It entered Earth’s atmosphere at a speed of approximately 19 km/s, penetrating 26 feet deep in to the ground. The Chelyabinsk meteor is the largest to have entered the Earth’s atmosphere since the Tunguska event, an explosion in Tunguska, Russia in 1908, thought to have been the result of a meteor impact. Students also had the opportunity to handle fragments from a meteorite explosion that occurred over Sudan’s Nubian Desert in October 2008. With an estimated mass of 80 tonnes, the explosion produced approximately 600 meteorite fragments, many containing nanodiamonds. 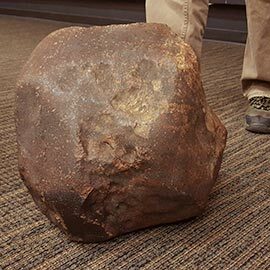 The meteorite and fragments will be on display in the Department of Physics and Computer Science at Laurier’s Waterloo campus throughout January. Faculty, staff, students, and members of the community are welcome to view the specimens. For more information on Laurier’s science programs, please visit our programs page or contact our Recruitment and Admissions office.